2013 May | Madplanet.com Inc.
Making the cake took way longer than expected even though I knew that it takes quite some time to finish a layered cake. So first I made the cake but when I baked it the cake did not rise enough to create four layers. So I made a second cake which rose a little bit higher but still created the unwanted dome shape. Then I made the Italian Buttercream which turned out good even though denser than expected. A few days later I created the macerated strawberries and the sirup. FInally I cut the two cakes in two layers each and cut off the dome shaped top, warmed up the butter cream and assembled the cake. Buttercream is like plaster where any rough surfaces or imperfections can be filled up and covered over. I still don’t know how to make a good, fluffy and level cake. The first cake came out bad because I forgot the sugar and when I added it later the batter did not look good and so it was not a surprise when it did not rise well. The second then looked great and it rose good in the beginning but in the second half of the baking the edges fell down and I got a high dome which meant I had to cut of a big chunk of the cake. I have another recipe which uses whipped egg whites to make it rise rather than baking powder. Next time I will try this instead. But maybe it is just my lousy oven that is responsible for the problems or my baking skills. One thing I might want to try is to cover the cake pan with aluminum foil to avoid a draft. I guess the only thing that helps is to try again until I succeed. Making the Butter Cream worked well until I had to add the butter at the very end. The cream deflated and became dense when I had all the butter added. Even though I took the butter out of the refrigerator early and cut it into pieces it still was cold inside the cubes. In another recipe they whip the butter and add it in one step to the base. The whipped butter has a more uniform temperature, is soft and when added all together it is much faster done. The recipe asks for way too many strawberries. I just used about half of them. 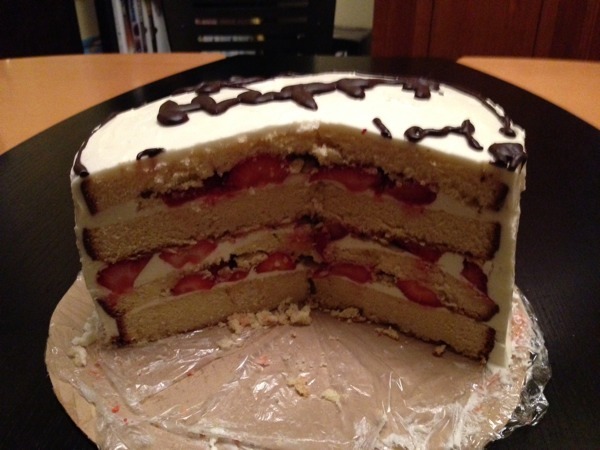 One problem I ran into is that the strawberries were too big, not soft enough and so messed up my cake layering. Next time I will slice the strawberries evenly so that when I place them between the layers they berries are a good and level foundation for the next layer. Next time I’m going to cut the cake into layers using a strong thread instead of a knife. This way I should get more even and equal thick layers. I also will use a decorating bag to build the wall at the edge of a layer to keep the strawberries and their juice inside. The biggest lesson I learned is to make sure that the strawberries create an even and not too thick layer in between the cake layers otherwise the cake becomes uneven and therefore hard to finish and decorate. Also the top layer can break if bend. My cakes were broken anyhow because of their dome shape when left cool off inverted but a bend can make them break even more. Another lessons is that there is nothing like too much butter cream. Until I am getting good at creating such cakes I will make at least one quarter more butter cream than the recipe asks for. The butter cream can help to glue pieces together, to even out gaps and to cover up mistakes. Some of the instructions in the book are misleading making me confused (like the preparation of the Butter Cream) and at other steps I would like to have more instructions. For sure the recipes are not for beginners and require some expertise in baking and making butter creams etc. On the other hand only making cakes will give me the experience I need to become better at it.